What was once a cool, trendy print, The Keep Calm & Carry On poster/t-shirt/mug, exploded out of the UK and became THE must have slogan accoutrement. I think most design magazines featured it in some regard and really, who could blame them? It's fab. Simple, to the point and inspirational. That said, there's a wonderful place where you can buy the aforementioned poster as well as many others inspired by it. The Keep Calm Gallery is a smorgasbord of creative motivating influences -- be it, towels, posters, mugs or cards. 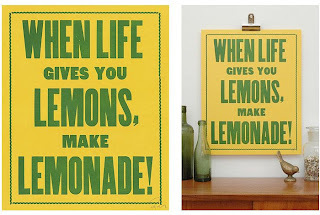 Take the sunny 'when life gives you lemons, make lemonade', or the refreshing 'tea revives you.' Feeling bossy - well, there's always 'eat your greens,' and the very effective "Get Lost!" cheekily overlaid on a map, of course. There's a mood lifter for all tastes.